In the decades after the American Revolution, inhabitants of the United States began to shape a new national identity. Telling the story of this messy yet formative process, Carolyn Eastman argues that ordinary men and women gave meaning to American nationhood and national belonging by first learning to imagine themselves as members of a shared public. She reveals that the creation of this American public—which only gradually developed nationalistic qualities—took place as men and women engaged with oratory and print media not only as readers and listeners but also as writers and speakers. Eastman paints vibrant portraits of the arenas where this engagement played out, from the schools that instructed children in elocution to the debating societies, newspapers, and presses through which different groups jostled to define themselves—sometimes against each other. 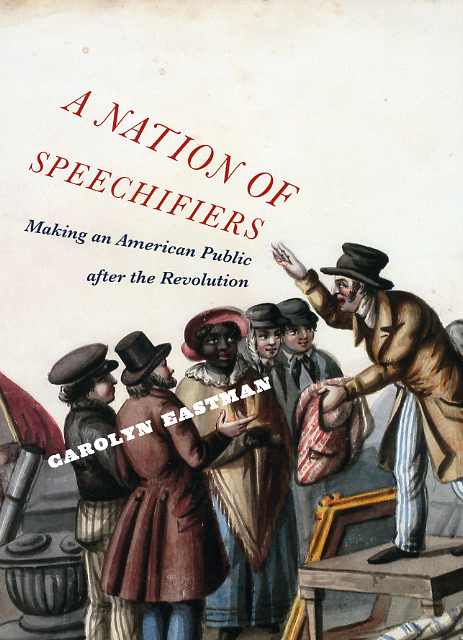 Demonstrating the previously unrecognized extent to which nonelites participated in the formation of our ideas about politics, manners, and gender and race relations, A Nation of Speechifiers provides an unparalleled genealogy of early American identity. 6 “Who’s Afraid” of Frances Wright?